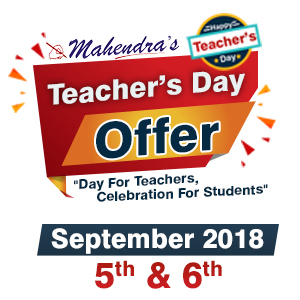 Mahendras has come up with an exciting offer to celebrate Teacher's Day, this offer will be valid from 5th September 2018(10:00 AM) to 6th September 2018(11:59 PM). "Saluting the selfless contribution of teachers, Mahendra's Teachers Day Offer will enable candidates to avail benefits of 4 speed-test cards at unbelievable prices." Original Price: Rs. 2500/-, Offer Price: Rs. 299 Only.